Green Sphene Gemstone - SOLD OUT! From I Got Your Silver Lining (IGYSL) "Up and Comer's Collection", we are excited to bring you this 'Sphene (Oval Cut, .90ct.) & White Zircon (Mixed Cut, 1.70ctw) Ring' set in Platinum over Sterling Silver. We are offering the most prized Green Sphene color. Sphene is actually a type 3 gemstone, which means that it is naturally included. Similar to Emerald. This is a very clean gemstone. We have not enhanced the clarity of these images, this is exactly how your stone will look when you open your new jewelry package. 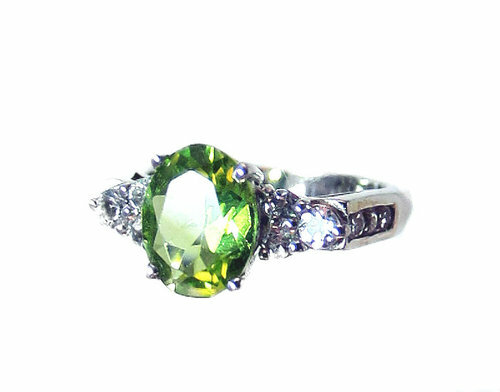 This beautiful Green Sphene is mounted with stunning White Zircon, TGW 2.60 cts and Ring Size 7. White Zircon is NOT the same as Cubic Zirconia. White Zircon is a natural gemstone that has a higher reflective index than Diamonds. This is investment quality Sphene, which we have mounted in a lower price point mount to make it more affordable for serious gemstone collectors. A gemstone collection is not complete with a Sphene. Be sure to check out our other loose Green Sphene coming soon to our website and eBay stores. If you could actually find this piece at your local jewelers, it's retail list is $1475-$1700. Using this month's pricing guide, IGYSL appraises this piece at $1500 list. You can pick up here as a part of our current Special for pennies on the dollar. IGYSL always offers our clients 30 day no hassle returns, complimentary shipping and returns (domestic clients, reduced rates for International clients) and personal shopping concierge services. We can also remount this Sphene into one of our 18KT or Platinum mounts. Additional fees will apply for the remount, but only to cover our materials. Our labor is always complimentary for our clients. Sphene (also known as Titanite) is highly coveted by serious gemstone collectors. Sphene is most commonly known as the "Christmas tree" stone! It has more dispersion than Diamond! Sphene is strongly pleochrochroic, meaning it shows three different colors when viewed from different angles or sides. Sphene is most commonly seen in green, yellow and brown colors. Sphene gemstones are excellent for calming emotions and releasing negative energy. Sphene gemstones are thought to help align one's physical, emotional and spiritual health, stimulating wellness and happiness. As part of our current promotion, our clients receive a complimentary gift with every purchase. Gifts are randomly selected by our shipping department, although we are happy to hear your request(s) on the type of preferred gift (ring, pendant, earrings, gem supplies, bracelet, loose gemstone). Gifts range in value from $50-$500. Click the button below to add the Natural Green Sphene Ring to your wish list.